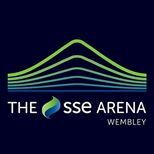 Wembley Arena (originally the Empire Pool) is an indoor arena, at Wembley, in the London Borough of Brent. It is located right next to Wembley Stadium. It was built for the 1934 British Empire Games, by Arthur Elvin, and originally housed a swimming pool, as reflected by its former name, Empire Pool. The pool itself was last used for the 1948 Summer Olympics. The building is used for music, comedy and family entertainment and for sport. The venue was renovated, along with Wembley Stadium, as part of the early-21st-century regeneration of the Wembley area. The arena refurbishment cost 35m pounds and the new arena opened to the public on 2 April 2006, with a concert by the English electronic-music band Depeche Mode. With 12,500 seats, it is London's second-largest indoor arena after The O2 Arena and third-largest indoor concert venue after the O2 and Earls Court Exhibition Centre, an exhibition hall which regularly stages concerts. The closest tube station is Wembley Park. This is in Zone 4 and can be reached on either the Metropolitan or Jubilee Lines. Upon exiting the station via the lift or stairs, pass under the tunnel onto Olympic Way. When reaching Wembley Stadium (do not walk up the ramps), turn right. Wembley Arena is situated across the road. Alternatively, you could travel to nearby Wembley Central. This is in Zone 4 and can be reached via the Bakerloo Line. Turn right at the station exit onto Wembley High Road and follow for approximately 200 yards. At the Wembley Triangle junction turn left onto Wembley Hill Road. Follow until Lakeside Way and turn right. Chiltern Railways run a service from London Marylebone to Wembley Stadium. Wembley Arena is located just off the A406 North Circular Road within easy reach of central London and the rest of the country, with major motorways connecting nearby. If you're coming from the North, take the M1/A1, then A406, then A404. From the East go M11, M25 (J23), A1, A41, A406 then A404. From the South it's M25 (J8), A217, A240, A24, A3, A306, A205, A406 then A404. From the West go M4, A312, A40, A406 then A404 For Sat-Nav searches please insert the post code HA9 0AA or search 'Engineers Way Wembley'. The 79, 83, 92, 182 and 224 all regularly run through the Wembley Arena area. There are 42 wheelchair accessible spaces within the auditorium and a number of seats for ambulant disabled patrons. There is an infra-red hearing assistance system available within the auditorium. Receivers are available for use with or without hearing aids from the venue reception on the South Concourse - A refundable deposit will be required for security. Assistance dogs are welcome, however dependant upon the event may not be able to remain within the auditorium. In such cases alternative provision will be made. Please check prior to arrival. There is a dedicated line for booking disabled and access seats. Please call 020 8782 5629.